Name a suitable natural wood and explain why it is suitable for the manufacture of this chair. This chair could be manufactured from most natural woods. Ebonised sycamore was used by Mackintosh to manufacture some of his chairs. Sycamore can be shaped and worked to form a variety of joints. When ebonised, the wood looks bold, dark and creates a strong image. Sycamore is durable and resists knocks and general everyday handling. Although a relatively expensive wood, it is ideal for a quality piece of furniture such as this chair. The chair looks extremely stable. It has four legs, spaced apart to ensure that the chair is unlikely to topple over when used. The high back supports the upper body, preventing the user from leaning back too far. The chair is well made, and the latticed back is probably mortise and tenoned, provides immense overall strength. The chair has been designed to be comfortable to use. The high back supports the user, so that he/she sits upright at a table, in a comfortably seating position. It has been designed with the height of a table in mind. 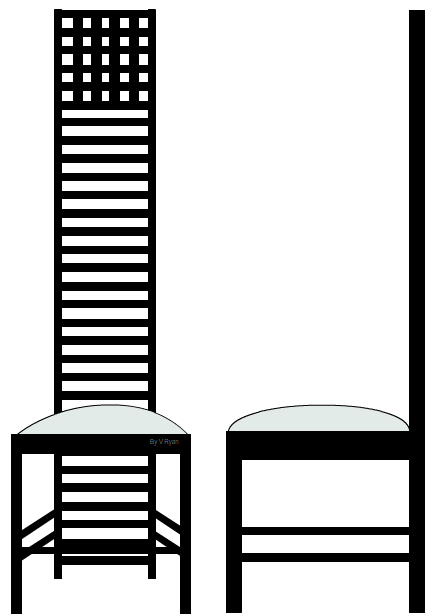 This ensures that a person sat in the chair can use items on the table without stretching, as the chairs height is relative to the table top height. The width and depth of the chair is designed for the average person. This is a stylish chair manufactured in 1903. Art Nouveau chairs of the time were highly decorative. This Mackintosh chair has many modernist features. It is plain and simple in style and yet has enough features, such as the lattice work on the back rest. It is a minimalist design, well manufactured by skilled craftsmen. This is not a mass produced piece of furniture, but made for a single customer. The chair has been designed to complement the room in which it will be installed.